The Cello Concerto is a major addition to the modern repertoire. (...) Truls Mørk plays both pieces with rich tone, total confidence, and a sure sense of the music's expressive trajectory. (...) Ondine's sonics are excellent. Definitely worth getting to know. Truls Mørk projects the close-knit solo writing (in Herma) with his customary finesse, and he is no less insightful in the Cello Concerto (2003) dedicated to him. (...) the Scottish Chamber Orchestra, who respond with alacrity to the assured direction of John Storgårds. Excellent sound and decent notes help make this disc worth investigating by those who have enjoyed Hallgrímsson's understated individuality. The two concertos on this CD (...) exploit the instrument's potential for keening lyricism rather than anything overtly modernist. Mørk's cello playing, delicate yet forceful, is a treat in itself. These are two substantial, shapely and very beautiful pieces (...). Mørk revels in the lavish solo writing, while Storgårds elicits from the Scottish Chamber Orchestra playing of the highest order. This disc is a real find - some startlingly fresh music in exceptional performances, and a rich, crystal-clear recording. (...) It's as if the soloist takes the listener by the hand and guides them through a strange landscape of entrhalling sounds and visions, conjured inspiringly by the SCO under John Storgårds. (...) Truls Mørk (...) is on exceptional from here. (...) Strongly recommended. This is (...) music of a very high order, wonderfully performed and recorded, and I recommend it to you with every enthusiasm. These two works are seminal in defining the rigorous integrity that filters through every pore of Hallgrímsson's music. (...) Mørk's realisation is gripping and inexorable, backed by sensitised support from Finnish conductor John Storgårds. These excellent recordings do full justice to a composer worth considerably more than his secondary reputation would suggest. The Norwegian star cellist Truls Mørk is known as a tireless champion of the very best contemporary music. On this release, his debut CD on Ondine, he portrays the Icelandic composer Hafliði Hallgrímsson (himself a professional cellist) with his two works for cello and orchestra, including Herma (1994; the name derives from a bust of Hermes used in ancient Greece as a good luck charm). Truls Mørk is joined by the forces of the Scottish Chamber Orchestra, one of the finest ensembles of its kind, under the direction of John Storgårds. 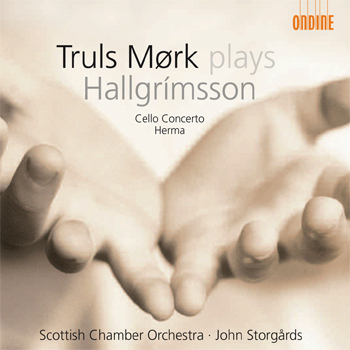 This CD includes the first commercial recording of the Cello Concerto, which Hallgrímsson dedicated to Mørk in 2003. Ever since, Truls Mørk has championed the work in a number of performances across Europe to great acclaim; while The Times called it, " a remarkable new addition to the cello repertoire... one of his [Hallgrímsson's] finest work to date..." (Hilary Finch, The Times, 28 January 2004), Scotland's Herald spoke of, "a work of haunting beauty" (Michael Tumelty, The Herald, 26 January 2004). This recording was supported by the Scottish Arts Council.